MY mother learnt to drive in a Beetle. A white one with gleaming chrome bumpers and hubcaps and shiny brown leather seats. A little woman, she needed a cushion to see over the hard black steering wheel, the loose seatbelt fastened across her waist in a purely token fashion. My father, whose broad towering frame was altogether unsuitable for this type of vehicle, was ensconced in the passenger seat barking instructions like a drill sergeant rather than the calm and encouraging instructor she needed. Too soon, I think, her confidence outweighed her prowess and she found herself in the ditch. I will never forget the sight or the choice words uttered as my father with his trousers rolled up tried to retrieve the car, the spinning wheels as my mother tried to help covering him in mud from head to toe. Memories, says Jutta Friese the general manager of marketing for Volkswagen in Australia, is the foundation of the Beetle's success. "It has such a history, everyone has a story whether it's happy or sad or funny. Its nostalgic charm is what keeps it going today." The latest edition of this legendary icon, only the third generation in 75 years, has a new body and engine but the same classic appeal. The shape of this Beetle is closer to that of the original than the New Beetle which was launched at the turn of the millennium, but in truth it is a world apart in terms of comfort. It is longer and wider with a roofline that peaks further back to create more headroom. It appears bright and airy but while there is plenty of space for the driver and front passenger especially with the seats pushed back, the rear seat, as funky looking as it is, should perhaps be only called into use on very short trips. The dash carries painted elements in the body colour which is a nice touch as is the second glovebox and chrome highlights on the instruments. Buttons and knobs as well as the infotainment system comes courtesy of the Golf although here there are more hard plastics and harder edges. The driver's seat is fairly comfortable although it was pretty flat with little of the bolstering we have come to expect from a car with this price-tag. Visibility is good helped in some part by a straighter windscreen and controls are nicely close to hand. Storage options are good with the boot space increasing by 101 litres to 310L with the rear seats up. Would be difficult to fit a pram in but the weekly shop would just about make it and yes, there are those all-important bag hooks. Here, too, the Beetle has much to thank the Golf for - a 1.4-litre twincharged engine that produces 118kW of power (almost three times that delivered by the mint-condition 1961 model that was also available to drive on the launch). favoured mostly by female drivers. We sampled both offerings during a 200km drive through twisty mountain tracks and open highways and can report a thoroughly pleasant experience. The manual stick is comfortable to the touch with a silky box, nicely weighted clutch and long gears making changes effortless. The DSG, though heightened in Sports mode, holds its own exhibiting only a smidgen of that garish reaching that the Golf can fall into during quick steep descents. Power is efficient and enduring adapting easily when called for while brakes kick in with not much urging. The electrically assisted steering wheel enhanced the driving experience and although it can be a tad flat in a straight line, it perks up around tight corners and bends providing excellent feedback and response. 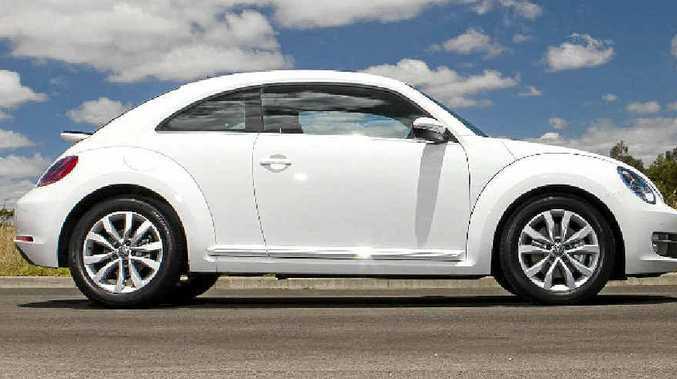 The Beetle comes with a whole host of features that set it apart from its predecessors. Standard inclusions boast 17-inch alloys, front and rear sensors, electric heated door mirrors, rain-sensing wipers, cruise control, Bluetooth connectivity with audio streaming, dual-zone climate control and two reading lights for those who still love looking at maps. Sat-nav will set you back $2500, a glass sunroof $1700 while the Tech Pack ($2700) will give you keyless entry, electric mirrors and Bi-Xenon headlights. A five-star ANCAP rating is courtesy of four airbags, electronic stability control, anti-lock brakes with brake assist, hill-start assist, external electric diff lock and daytime running lights. The Beetle is a car that pulls at the heartstrings and has an appeal whether you're 60 or 16. It is not say, the best family car around or the most sporty car or even the most economical car - but that won't stop people buying it. There is a good blend of drive quality, equipment and quirkiness and that may be enough. During our test drive, as in the official figures, the manual ran richer (6.8 litres/100km) compared to the DSG (6.4 litres/100km). Our figures were harsher than those of Volkswagen's but our route was probably not the fairest indicator. The Beetle comes with a three-year unlimited kilometre warranty as well as a six-year/90,000km capped price servicing program with the first six services (15,000km/12months) costing a total of $2623. "We were wanting to make a car with a direct connection but a different style to the original," said Frank Breuse who was a member of the design team. "We took American muscle cars and classic porches as inspiration but kept the passion of Beetlemania." The result is a compact sporty unit with crispy lines and pronounced wheel arches. The headlights remain circular but the tailgate is now a single unit with an uncluttered bumper. The good stuff: Sporty, fun drive that is nostalgic but modern at the same time, good handling. What we'd like to see: More comfortable seats, fewer hard plastics. Warranty and servicing: Three-year unlimited kilometre warranty, six years/90,000km fixed-price servicing. Details: Three-door front-wheel drive hatchback. Engine: 1.4-litre turbocharged four-cylinder petrol generating maximum power of 118kW at 5800rpm and peak torque of 240Nm between 1500rpm - 2400rpm. Transmission: Six-speed manual or seven-speed DSG. Consumption: 6.4 litres/100km combined average (DSG) and 6.8 litres/100km for the manual. CO2: 148g/km (m); 158 (a). Performance: 0-100kmh in 8.4 seconds.